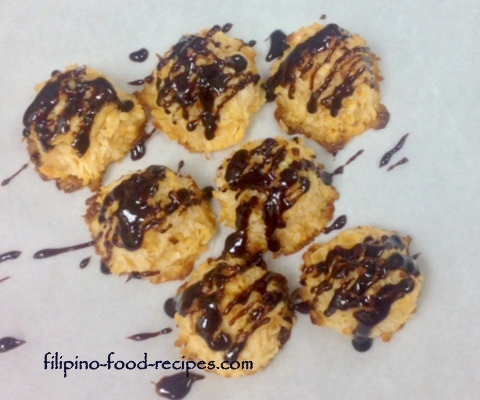 An easy coconut macaroons recipe, it is so quick that you could prepare and serve in no time at all. 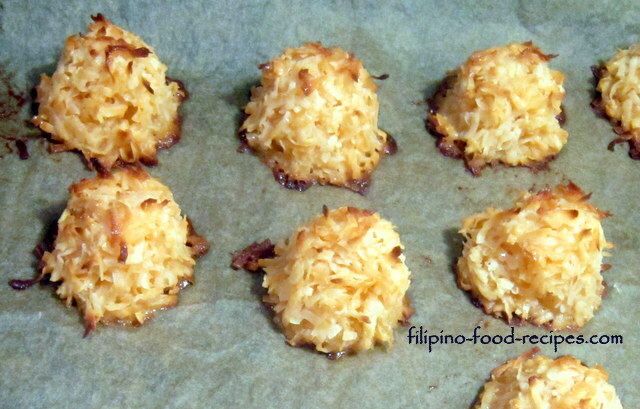 This is not like the molded dessicated-coconut-macaroon shaped like a mini cupcake, which is the more popular Filipino macaroon. It is made from freshly shredded coconut, condensed milk and cornstarch -- so it is sweet, chewy, sticky and simply delicious. The coconut has to be just damp or slightly wet so it is important to wring out any excess liquid. 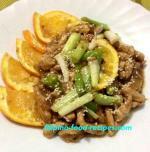 Once you mix the ingredients, it will have a sticky consistency, without any runny liquid at the bottom. I would like to note that I got the base recipe from Ms. Rose Levy Beranbaum's "Mom's Coconut Kisses" from her book Rose's Christmas Cookies. She extracted the fresh coconut from the shell by baking, cracking, then removing the meat from the shell, peeling off the brown outer skin and grating the white part in a food processor. Well, as for me, I think I would rather buy shredded coconut from the market, or find alternate ways to get coconut flakes, I skipped the cracking and extracting coconut from the shell. But if you don't have that option, you could refer to the How to Process Coconut page from this site. 1 Wring out any excess liquid from the fresh coconut, it must be just damp and not dripping wet. 2 Mix together all the ingredients. 3 Using an ice cream scooper, portion the coconut mix and mound on a lined baking pan. 4 Bake for 18 - 20 minutes or until golden brown. 5 Serve as it is or dress it up by drizzling melted chocolate on top. If all you have is shredded frozen coconut, you could use it as long as you wring out excess liquid. The coconut cream liquid extracted could be frozen and saved for another use. Or if all you have is the packaged sweetened coconut flakes, hydrate it first by pouring 1 - 2 tablespoons coconut milk or regular milk to make it damp, then put LESS condensed milk, like by 1 or 2 tablespoons LESS so the macaroon would not be too sweet. To melt the chocolate morsel, set on a double broiler or microwave in 10 - 15 seconds increments to melt slowly without scorching. Instead of chocolate, you could also flavor it with lemon extract : just add 1 teaspoon lemon extract in the recipe.